Stardream_Metallic_Envelopes__Paper is rated 4.6 out of 5 by 31. Rated 5 out of 5 by SURVIVOR from Fantastic! I've looked all over for different colored envelopes to place $ gifts in, what a blessing to find you. Thank you. Rated 5 out of 5 by WeJam2019 from EXACTLY what I was looking for! I purchased silver metallic cardstock for my DIY wedding shower invitations. They are PERFECT for letter foiling. Rated 5 out of 5 by Pegs from Impressive Excellent product. Quick delivery. Will definitely order again. Rated 5 out of 5 by jks53 from beautiful! I am so happy with the quality and look of these envelopes. This is a quality product and it is beautiful. Rated 5 out of 5 by Ink on Elm from Easy ordering, quick shipping and great line of products. Thanks JAM Team! I needed Stardream Copper Metallic paper fast. JAM came through with just what I needed and shipping in a flash - also at a great price. Rated 5 out of 5 by mack from Excellent product I was concerned about the true color of the paper as we were using these envelopes for a specially made card for client Christmas gifts. They were just what I wanted and in both sizes I needed. Can these envelopes be printed on through a laser printer? Do you have 9 x 12 &amp; 10 x 13 envelopes that extend at the bottom to 1 to 2 inches? Hi there! Most of our plastic envelopes have an expansion of 1 inch (some have more than that!). I would check out our wide selection! http://www.jampaper.com/Envelopes/PlasticEnvelopes Hope this helps! You can print on an inkjet, but the color will not be as sharp. Laser printers are usually the way to go for best results. what is the gsm for this 110lb card stock? Hello! This 110lb Cover would be 298 gsm. Thanks for the question! Could we get a sample of this? We will be ordering 1000 if the color is right. We can send you a paper sample for color. Once you select a size and color, click the &quot;Request a Paper Sample for Color&quot; button (in green text). Let us know if you have any additional questions! Can this envelope be printed on with our ink jet printer? Or will the ink smear with the pearlized finish? Our pearlized finish (also known as stardream) is best used with laser printers. Ink jet printers may result with smudging, but that is not guaranteed. Thanks for your question. Can you print on these using a laser-jet? Yes you should be able to print on these using a laser-jet printer. You want to remember though, this is thick paper so depending on the size of your printer it might jam, no matter if it's laser or inkjet. Is this just yellow or a shiny metallic stock? How exciting is it when one particular envelope stands out in your mail? When you search through all of your bills and random advertisement letters and see something 5 star envelopes in the midst of the boring junk? Give that experience to your friends and loved ones by using our Stardream Metallic Envelopes! Stardream envelopes are perfect for holding gifts, invitations, greetings, and announcements. Our Stardream Metallic Envelopes will always add that extra shine that is sure to be noticed quickly! All of our Stardream envelopes have matching paper and cover stock. 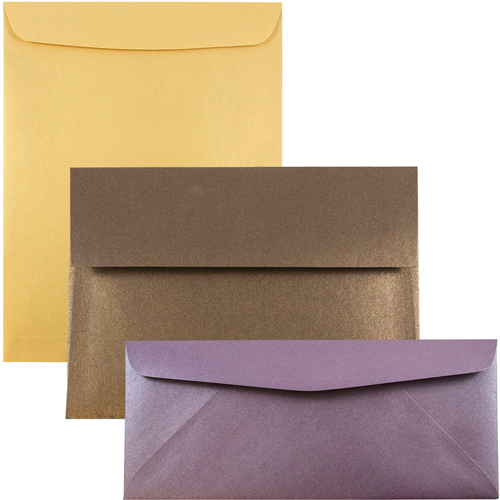 Stardream Metallic Envelopes go great with matching paper & cover stock! Giving the paper and envelope charm! Stardream Metallic Envelopes are available in: 3 1/8 x 3 1/8, 4 Bar, A2, A6, A7, A8, A10, A10 Policy, #10, #10 Button & String, #10 Policy, 6x6, 6 1/2 x 6 1/2, 8 1/2 x 8 1/2, 9x12 Booklet, 10x13 Open End, 80lb paper, & 110lb cover. Stardream envelopes are available in: Anthracite, Quartz, Jupiter Red, Opal, Ruby, Gold, Silver, Sapphire, Copper, Malachite, & Bronze. Just change the size or the color to change the picture.